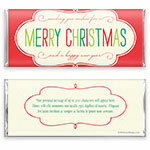 Charming and whimsical, this delightful Christmas candy wrapper is a perfect complement to any celebration. Design: Vintage inspired diagonal stripes, hand-drawn frame and multicoloured text. 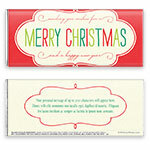 Personalization: Front greeting with back message.